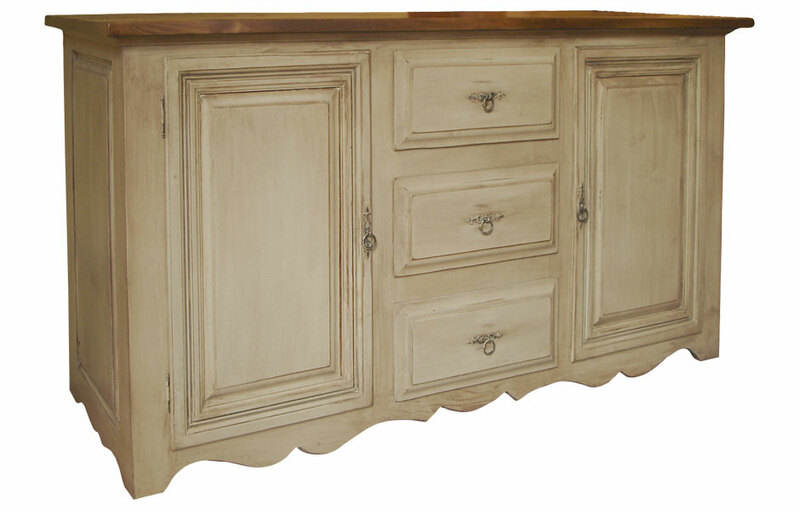 The Country French Buffet has two doors and three drawers with scrolled moldings and raised side panels. The drawers are on wood runners for ease of opening, the drawer faces are raised. The doors have raised panels with flat insets and framed, mitered moldings. There is one shelf behind each door, it is centered in the opening. The knobs are metal ring pulls. The Country French Buffet appeals to the European traveler in all of us. The raised panels, forged-iron ring pulls, and contoured skirt harkens us back to the old country. 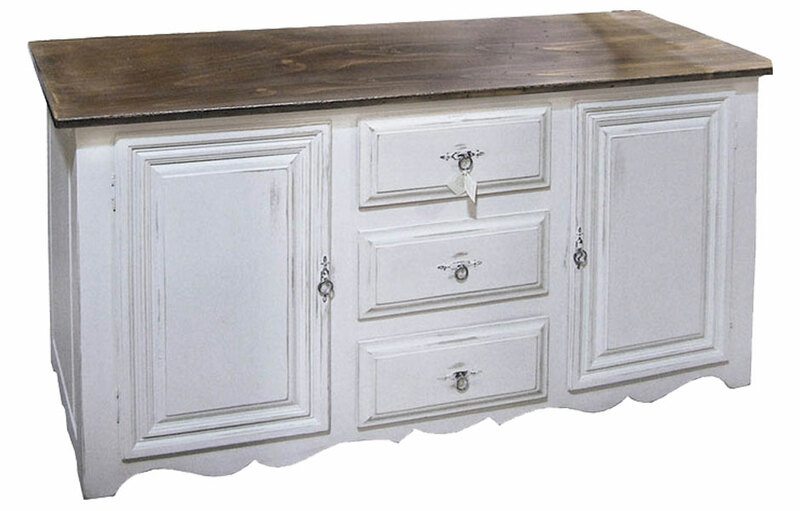 The understated French details make this Country French Buffet compelling. The two doors and three drawers provide ample closed storage for tableware, linen, and flatware. The scrolled moldings and raised side panels add an ornate touch. The drawers are on traditional wood runners for ease of opening. The drawer faces have raised panels adding dimension to the sideboard. The console doors have raised panels with flat insets and framed, mitered moldings. There is one interior shelf behind each door, which is centered in the opening. The knobs are hand-forged ring pulls. The 6ft. 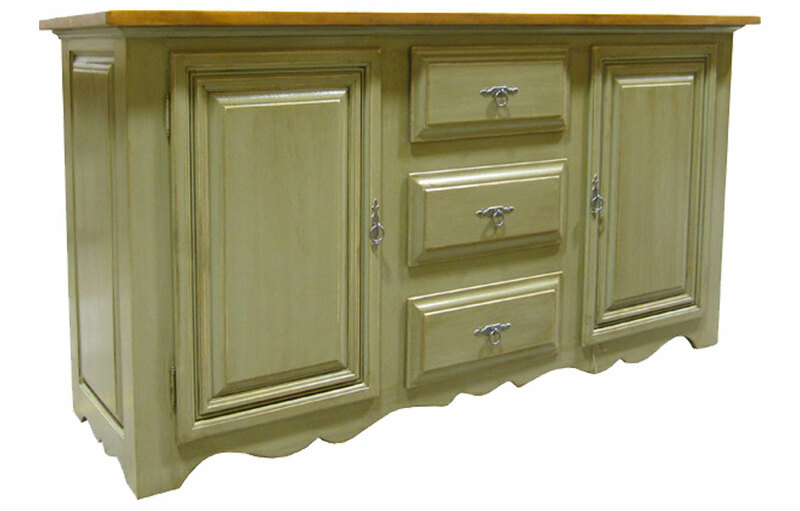 long sideboard can be painted in a classic two-tone finish with a stained interior and top, with painted exterior, or all-over one color finish. The top is water-sealed for daily-use, and food and drink service. 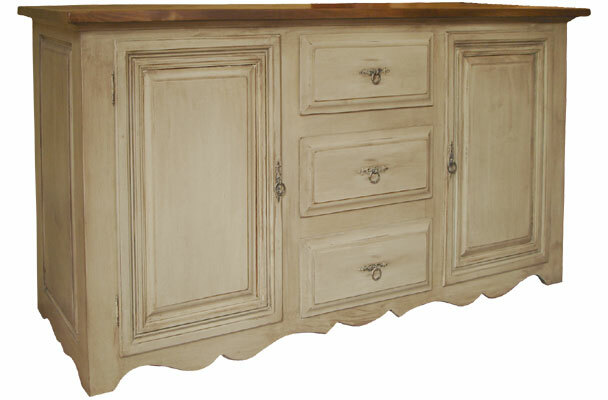 The Country French Buffet complements French Country, English Cottage, Farmhouse, Rustic, Transitional and Traditional style decors. 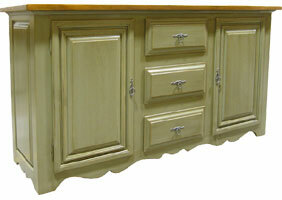 Country French Buffet finished in Millstone. Country French Buffet finished in Acadia Pear.